General. 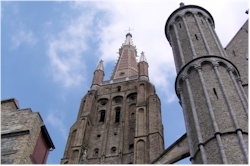 The slender tower of the church of Our Lady (Onze-Lieve-Vrouwekerk) dominates the skyline of Bruges. With its 122 m, the tower is the highest building in Bruges and it even is the second tallest brick building in the world. 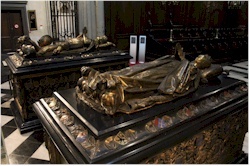 Besides its dimensions and impressive gothic architecture, the church is renowned for being the burial place of Mary of Burgundy and posessing the statue "Mary with Child" by Michelangelo. Brief history. The building of the church started in the first half of the 13th century on the location of an earlier church in romansque style. It took until the 15th century before the construction was finished, including the tower, the northern and southern side aisles. From the 15th century on, several additions were made such as side chapels and reconstructions (notably to the spire of the tower). Restorations to the outside were recently finished so the tower is now showing all its splendour again. Particularities. Inside the church there is a rich collection of paintings from 16th and 17th century from masters such as Pourbus and a few very old graves (from the 13th century) that were discovered a few decades ago. 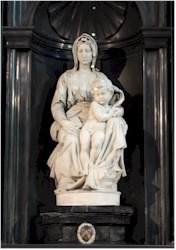 One of the biggest treasures is the marble sculpture "Madonna" ("Mary with Child") by Michelangelo. It is said that it was initially intended for a church in Italy. A rich merchant however bought the masterpiece and had it installed in the church. It is said that it is the only work of Michelangelo that left Italy during his life. Other eye-catchers are the tombs of Mary of Burgundy (amongst others titles she had she was duchess of Burgundy and Flanders) and Charles I the Bold (father of Mary). Sidestory: bailiff Pieter Lanchals (he had a chapel bearing his name built in the church) governed Bruges in the name of emperor Maximilian of Austria untill his death in 1488. During an insurrection of the towns against Maximilian, he was captured and tried. Found guilty, he was condemned to death. His head was placed on a spike at the Gentpoort and his body burried in the church or Our Lady (where his tomb still is).